Total train ticket fare cost was more than $1,100 for all schedule types. Route included was Paris-Marseilles-Lyon-Geneva-Bern-Lucerne-Luxembourg-Brussels-Amsterdam-Cologne-Hamburg-Berlin-Fussen-Munich-Prague-Vienna-Salzburg-Deichtstein-Venice-Milan-Florence-Pisa-Rome. I have soft copies of all booked tickets on my mobile phone in case the barcode of print-out hardcopy I brought is unreadable. Usually 2nd class are free seating assignment especially on off-peak timings, whether in upper or lower deck. I always double confirm the ride by looking again on print-out ticket, bulletin board, section letter, class type, led monitor on the body of the train and inside, transfer station, route and seat allocation (if applicable). As what happened to me, I ignore the route allocation, I just hopped in. A fine of 3Chf has been charged (current ticket price subtracted by purchased ticket). For every train station I arrived, I went first on the departure timings bulletin board (yellow paper posted inside anywhere) to confirm my next destination. Then, if there's a query or doubt, I went to Train Information Desk. Afterwards I went to Tourist Info Office and grab a free city map. I usually start my journey by navigating the hostel first, leave bag then begin the tour. If no hostel, go to train station locker area then proceed to city tour. 1. 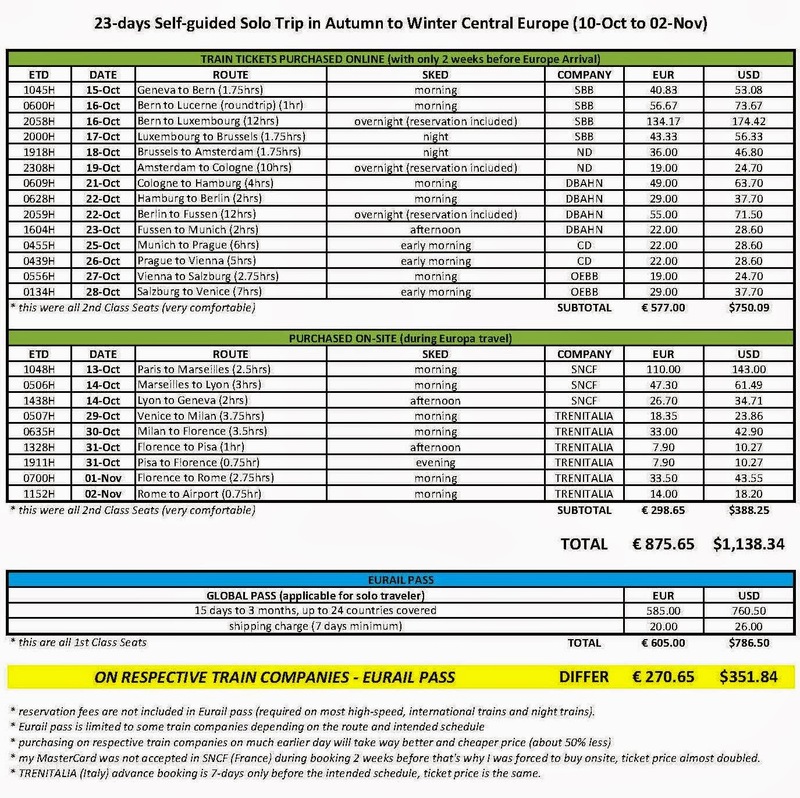 Around 585 Euro ($761) 1st class only offered for solo traveler plus $25 delivery charge. 3. There are some promo fares offered on respective train companies. 5. 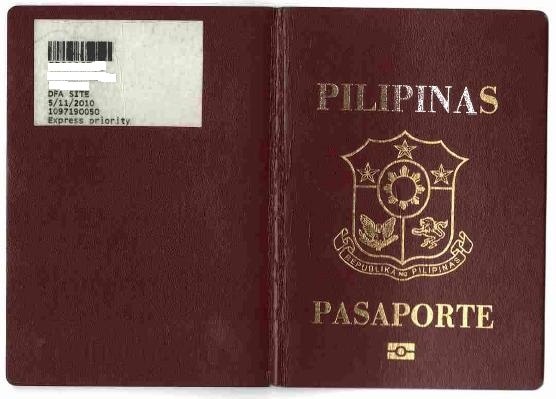 I have almost less than 2 weeks before my flight departure when I received my visa. Home delivery has 7days minimum. 6. Most of the travel online forum suggested to book tickets as early on respective train companies, they do not recommend to buy Europass. 8. The main reason; I am not sure if this more than 30 days vacation shall be approved because of complications and operational requirements at work. Since most of the booked tickets are open time, you may ask the infodesk to print-out schedule as route planner. Most of the time I got easily bored so I decided to take the much earlier departure timings. Request for a printout of entire train journey details in Train Infodesk is free. Europe trains doors have a push button / door handle to manually open should you want to be alight or aboard. Metros in Germany, Czech Republic and Austria have no machine readable ticket door blocker, only a simple small ticket validator and your honesty how to use it. Be warned if caught with no ticket, underpaid or unvalidated. 4. If still in doubt, ask the Train Infodesk first or the fellow passenger aboard. - During bookings, my credit card (mastercard) was accepted in other train companies except in France; SNCF and Ouigo trains. I asked their customer service via email. SNCF replied by asking to call them while Ouigo has no response. Initial check, it was 25 Euro around 4 weeks before flight departure, then very surprisingly, there is no walk-in ticket payment. No choice, I bought ticket to SNCF (TGV) which had a monstrous amount of 110 Euro from last mock booked of 45 Euro (more than a month ago). Not just that, train departure was delayed by 30mins. What a bad day. - Upon arrival in France, good thing somehow my credit card was now approved in SNCF when I went to internetshop in Marseilles for 30min @ 1 Euro. But again, compared to initial price, ticket boost to almost 50% increase. Another problem rosed when I interchanged the confirm booking on machines in train station, international Mastercard was not accepted again, only Mastercard Europe-issued and other major credit cards. Aside from reference #, credit card is also needed to obtain the ticket print-out in machines. Since my ETD to Lyon was 0506h and the SNCF ticket counters opened @ 0500h, I have to run faster than speeding bullet for the tickets to be printed-out (hard copy is required). - there is no wifi onboard, only 220v outlet. Trains are comfortable, even the toilet. 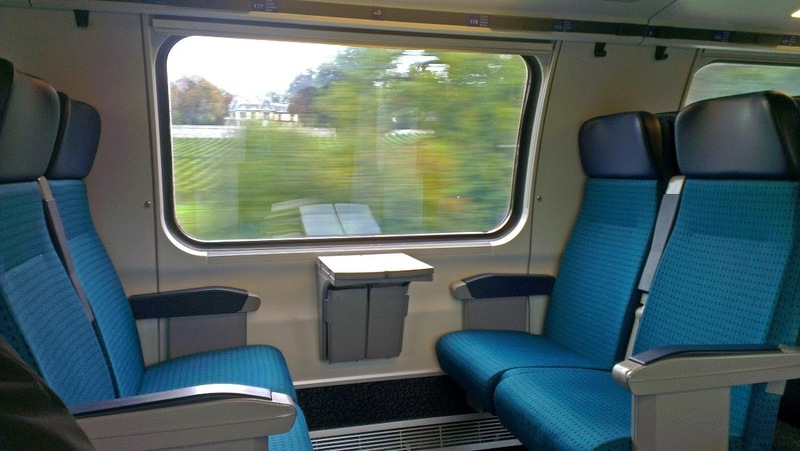 - Ouigo trains are the cheapest and usually on sale by almost 50%. The main problem on this train is that there is no walkin buy for ticket and I think allowed only for credit card issued in Europe, so perhaps this train is ideal for Europe residents only. This was my observation only, try your luck. - France is included in global Europass but not in selected pass Europass. - I think France SNCF is the expensive in all train companies in Europe. - ticket is open sked within 2 months as indicated on all major routes. * Switzerland was the only had IO manned their regional train stations. Of course, belonging to a 3rd world country unknown to them, I was the subject of very detailed bag insp, as in all of my belongings have been thoroughly inspected. - I purchased ticket online; Geneva to Bern, Bern to Lucerne roundtrip and Bern to Luxembourg. The route from Lyon to Geneva is scenic, try not to sleep or not to book at night. I think I saw Alp range and its really breathtaking. - online ticket purchased must be printed in a neat paper as this will serve as onboard ticket for inspection. - tickets is open sked within the a month as indicated in all major routes. Like in my case, I purchased IR (inter-regional) train type with later sked but during the travel I got bored and decided to aboard earlier train departure on IC (intercity) train type, same outbound destination. If doubt, ensure your plan by asking the Info booth. - free seating in 2nd class, best place is upperdeck. - check carefully the platform, destination and booked time sked as there is NO STAFF roaming around in the train station to assist. - ensure that the order ticket print-out must be exchanged to a regular ticket in SBB ticketing helpdesk before taking platform especially for regional trips. Standard ticket print-out must have barcode. As what happened to me, I almost arrived to the platform 1st before the train departed, good thing I have experience already on ticket fines thats why I immediate looked for SBB helpdesk. I was right, the one that I had printed-out was just a purchase order. - SBB citynight train sleeperette coach has no outlet plug, even the train transfers up to luxembourg. Though we departed Bern in time, we arrived 40mins late in Koblenz Hbf. Good thing there was a more than an hour allowance to aboard on transfer train.